Many of us can remember favourite, special toys from our childhood that comforted us when we were upset or anxious, as well as being our constant companions day to day. It’s no surprise then, that parents love to give their children toys to cuddle and snuggle with – and we’ve found just the ones. European children’s brand Nattou has been producing soft toys and children’s gear of the highest quality since the late 1980s. Their range is vast, and includes soft toys, musical toys, security blankets, squeakers, rattles, play mats and rockers. The Nattou cuddly toys are so much fun to look at and their gorgeous plush materials feel comfortably soft. 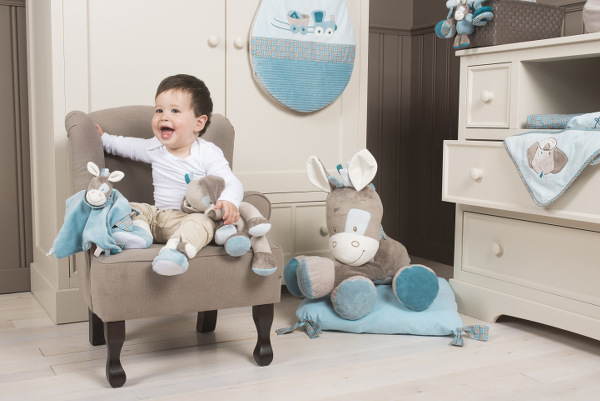 With a range that includes just about every cuddly animal that’s ever made its way into a children’s bedroom, there’s bound to be a special friend for your child here. Pictured here are their two most recent lines, Manon and Alizee (an adorable cow and hedgehog in pinks and browns) and Gaston and Cyril (a dog and horse in blues, browns and greys). As you can see, the range is much more than just stuffed toys. With musical rattles, cuddly blankets and play mats too, there’s plenty of scope to find that special item that your child will love. The colour, style and quality of materials are all designed to endure the test of time and the sometimes extreme affections of children! Perfect for Christmas or a special occasion, these lovely European designed toys make a gorgeous keepsake present for that special little person. They know their audience, too. One of the best suggestions I picked up from Nattou is that it’s worth buying two of your child’s special cuddly toy. Why? It means you’ll never face that situation that every parent dreads – the discovery that the favourite cuddly has been left in a shopping trolley, or at grandma’s house – just swap it for your spare. Special mention must be made of the Nattou rockers. Little children love rocking toys but if you’ve ever tried to balance a toddler on a normal rocking horse, you’ll know what a stressful experience that can be! Not so with the Nattou rockers, which are not only adorable to look at, but easy to ride. With a timber frame and a soft fabric body, the rocker has a safety belt and supportive seat, which make it suitable for use as soon as your child is able to sit up until about age three. What’s more, it comes in seven different designs. You can find the Nattou range at Baby Bunting and most independent baby shops nationally. See the full range and find a stockist near you at Nattou.